Back when APEX 5.0 was released, these forward thinkers at the development team installed a feature to verify your Universal Theme against the one defined in the repository. There hasn't really been anything to verify against, until now. 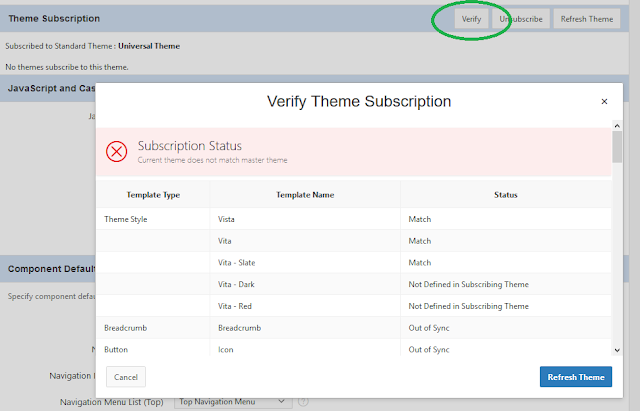 There are a number of changes to the Universal Theme, and one way to explore these changes is to check out what's reported under the Verify button in the Theme definition. ORA-20001: Unable to subscribe to report template. Errors aside, this facility all planned, of course, to minimise the impact theme upgrades have caused in the history of APEX. And no doubt used internally while they were developing UT in the first place. As Patrick Wolf points out in this forum post, some features aren't borne out of the IDE upgrade alone, but are found with the theme upgrade. This includes RTL functionality. A couple of new default styles, to go along with Slate. Nice. Every other template has been touched in some way. It would be nice to see a diff of the updates. If your Universal Theme is still locked, you just refresh your theme definition and your application should continue to work wonderfully. Take care if you have any customisations or extensions, regression test as necessary. We've tried to minimise ours so it will be interesting to explore when 5.1 becomes generally available. There are some awesome tools in the reference section alone.